Ankara rolled out its plan for an offensive on Daesh bastion Raqqa, as Chief of General Staff Gen. Hulusi Akar met U.S. Chairman of the Joint Chiefs of Staff Joseph Dunford at İncirlik Air Base on Friday, according to Turkish media reports. The plan reportedly excludes the PKK's Syrian offshoot, the Democratic Union Party (PYD), and its armed wing, the People's Protection Units (YPG). 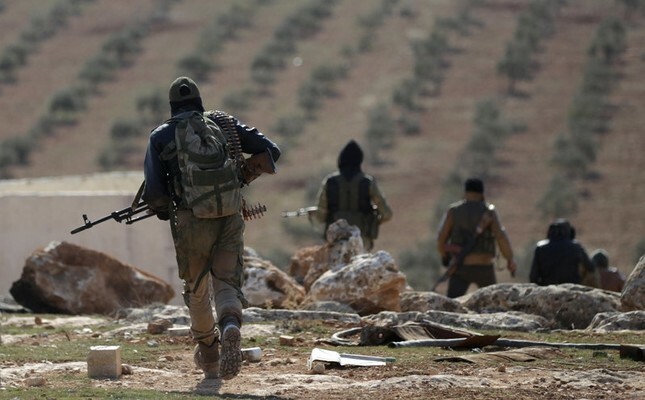 Ankara suggested that Free Syrian Army (FSA) elements, which have successfully liberated Jarablus, Dabiq and al-Bab, as part of Turkey-backed Operation Euphrates Shield, be allowed to enter Syria through PYD-held Tal Abyad to reach Raqqa, according to an article in the Hürriyet daily. The plan that Akar laid out reportedly envisages a 54-kilometer-long and 20-kilometer-wide corridor for FSA elements. Meanwhile, President Recep Tayyip Erdoğan yesterday reiterated that Raqqa could be cleared of Daesh's presence if Ankara and the U.S.-led coalition reached a deal. Speaking in the southeastern province of Gaziantep, Erdoğan said, "If we come to terms with coalition forces, we will be able to cleanse Raqqa of Daesh as well." Another prominent Turkish daily, Yeni Şafak, claimed that Akar urged that PYD elements withdraw from Manbij so FSA fighters could march towards Raqqa from there. The YPG, under the guise of the Syrian Democratic Forces (SDF), has been on its way to Raqqa. According to sources close to the YPG, which Ankara considers a terrorist group, it was only kilometers away from Raqqa, the Syrian city on the northeast bank of the Euphrates River. The Obama administration supported the PKK-affiliated YPG, and despite Ankara's ultimatums and stern warnings, the U.S. did not abstain from further solidifying relations with the terrorist group. However, whether the Trump administration continues this backing is still a question. A major policy shift in Washington in favor of Ankara could be a game changer on the ground. According to reports, Akar told his counterpart that ground forces were vital to retake Raqqa. Though Turkey will not get directly involved in an operation to liberate Raqqa from Daesh, it will provide tactical support, as confirmed by Prime Minister Binali Yıldırım on Saturday. Ankara has claimed that several thousand FSA fighters were ready to engage Daesh to liberate Raqqa. The FSA has been effective in Operation Euphrates Shield, which began in late last August to improve security, support coalition forces and eliminate the terror threat along Turkey's southern borders. If Washington decides to go with Ankara's plan to liberate Raqqa, it will need to convince the YPG to let FSA troops, in cooperation with the Turkish military, pass through Tal Abyad to Raqqa. The U.S. may have to cut off its ammunition and weapons supply to the terrorist group. Meanwhile, Prime Minister Yıldırım met Kurdistan Regional Government (KRG) President Masoud Barzani in Munich. The two leaders discussed regional problems and reiterated their determination to fight terrorism.